My brother Ben Wetzel making good time approaching sunset while backpacking in the Flat Tops Wilderness, Colorado. Tucked into a remote part of Northwest Colorado, Steamboat Springs is surrounded by wilderness and filled with adventure. Although there are many activities in which to indulge, backpacking is certainly one of the best ways to explore the area and get acquainted with the Yampa Valley. In the high country, the months of May and June are highlighted with massive amounts of snowmelt, making July the perfect time to gear up and hit the trail. Driving north on Routt County Road 129 and following Seedhouse road to the Slavonia trailhead will grant you access to the Mount Zirkel Wilderness. Designated in 1964 and protected by the Wilderness Act, the Zirkels encompass nearly 160,000 acres. The scenery here is nothing short of dramatic, with over 70 lakes and endless creeks dwarfed by sheer peaks as tall the 12,180ft Mt. Zirkel. Over 20 trailhead locations access this wilderness area from either side of the continental divide, making it a great retreat for all of northwest Colorado and Wyoming. Short overnight trips and unbelievable multi-day loops await you, linking over 170 miles of trail. While Gilpin Lake, Gold Creek Lake, Mica Lake, and Three Island Lake are some of the most popular spots, the less traveled Lake Katherine, Bighorn Lake, Bear Lakes, Roxy Ann Lake and Rainbow Lake are heavy-weights in their own right, offering solitude and some great fishing to compliment. Regardless of your age or background, the last few miles of trail are always plagued with thoughts of caloric consumption. Top off your trip with a cherry and make a pit-stop at the historic Clark Store in Clark Colorado. Fresh hearty sandwiches and mouth-watering burgers, grab a beer or an ice cream shake – this is a diamond in the rough that will make any backpacking trip a memorable experience. Self portrait overlooking Gilpin Lake while backpacking in the Mount Zirkel Wilderness, Colorado. 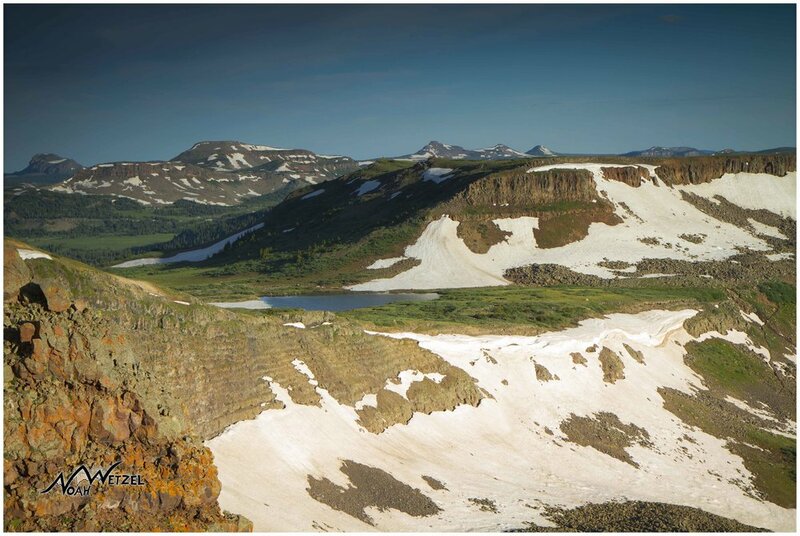 Switch up the scenery and head south on Hwy 131 to the town of Yampa – the gateway to the Flat Tops Wilderness. Colorado’s second largest wilderness area is a relatively gentle landscape of rolling valleys surrounded by massive volcanic flat topped peaks. 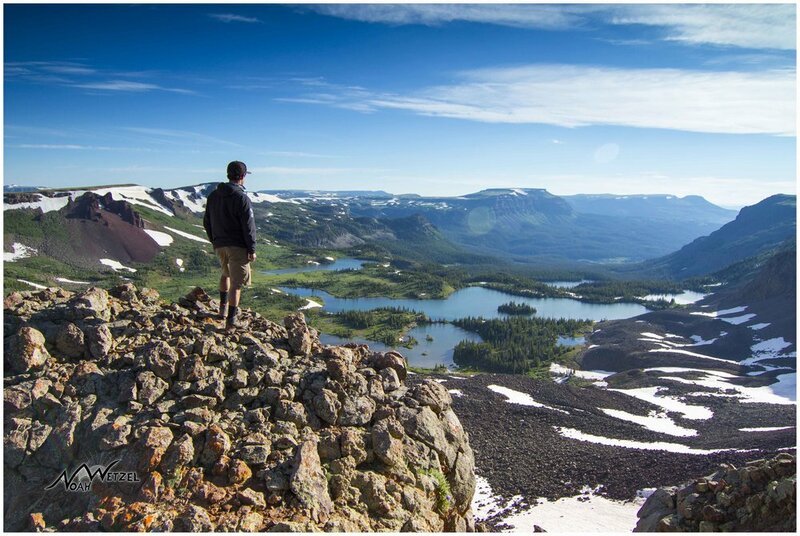 The terrain drastically contrasts the Mount Zirkel Wilderness yet offers the same euphoric wilderness experience with over 170 miles of trails that cross beautiful alpine tundra, 100 miles of fishable streams, and over 110 lakes and ponds. If you are looking for a quick overnight trip, head out on CR 7 from the town of Yampa and follow it to the Mandall trailhead. Trail 1121 will guide you through small clusters of Aspen Trees and open tundra while you climb and traverse at the slope of a massive cliff wall, highlighted with a beautiful spire of rock that towers over Slide Mandal Lake. Roughly 4 miles in, Black Mandall Lake is your destination and nothing short of dramatic. If you have a few days to explore, continue on CR 7 up to the Stillwater trailhead where you will find an endless variety of backpacking loops. The Chinese Wall (trail 1803), Trappers Lake, Skinny Fish Lake, and Island Lake will leave you speechless, however make a priority to visit the stunning and seldom seen Keener Falls. This unbroken stream of water plunges off the high mesa cliffs, plummeting over 200ft and crashing upon the scree field below and cascades into Keener Lake. Less than 4 miles from the Stillwater TH, Keener Falls is dependent upon snowmelt, therefore make sure to pack some bug spray and hit the trail no later than mid-July. Finally, a successful backpacking trip in the Flat Tops Wilderness isn’t complete without celebration. Located in Yampa, grab a booth or a bar stool, a bite and a beer at the historic Antlers Cafe & Bar, a staple of the community since 1905 – one of the many reasons to return to the wilderness of Steamboat Springs, where endless adventure awaits. The amazing 200ft Keener Falls cascades into Keener Lake in the Flat Tops Wilderness of Colorado. 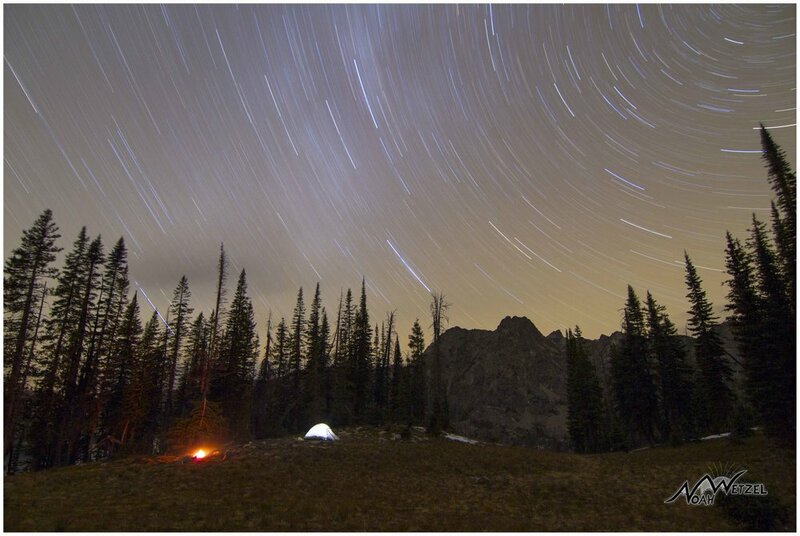 My brother Ben Wetzel backpacking in the Eagles Nest Wilderness near Steamboat Springs, Colorado. *Before you start planning your backpacking trip, make sure to pick up a detailed map of the wilderness areas offered by National Geographic Trails Illustrated (Zirkels: Map #116) (Flat Tops Wilderness: Map 122), or the “Steamboat Zirkel” map by Sky Terrain both available online (www.skyterrain.com / www.natgeomaps.com) or locally at Ski Haus on Pine Grove Rd. in Steamboat.